Really does a great job highlighting how very alike Patriots and Loyalists were. It wasn't a case of the people who believed Englishmen can only be taxed by themselves opposing the people who believed that their ultimate loyalty was to the Crown. Rather, both groups believed BOTH that Englishmen could only be taxed by themselves AND that their ultimate loyalty was to the Crown, and it was simply a matter of which one won out when they were finally, and unwillingly, forced to choose one over the other. Also brought into focus something about Benjamin Franklin that I already knew the fine points of, but had never really connected into a theme: that he actually did a pretty poor job reading the mood of the colonists during that 1763-75 when he was supposedly the true voice of the colonists in London. His appearance before the House of Commons arguing against the Stamp Act is legendary, but he only had to make it because he had blundered so badly beforehand, when he had recommended a friend of his for the post of Pennsylvania stamp distributor, so enraging the Philadelphia mob that a an angry crowd converged on his house in Philly and would have burnt it to the ground had his wife not refused to leave it. Or there was his initial reaction to the Boston Tea Party, to demand that the city of Boston should reimburse the East India Company for the lost tea. Ben also comes off looking very bad with his utter, unfeeling disownment of William during and after the war, insisting that William should have taken Ben's side in the Revolution out of family loyalty even though he disagreed with him, a really striking bit of hypocrisy from a man who had never practised much family loyalty himself and who had always raised his son to think for himself and follow his own convictions. 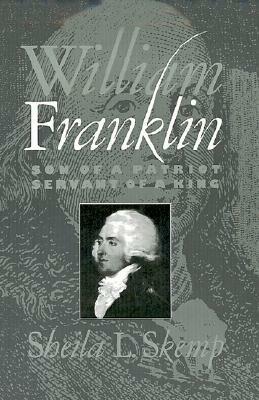 But my biggest takeaway from the book is to look at the three generations of Franklin men--Ben, William and William Temple--and realise that it's the two who lived in England (Ben and William Temple) who took the side of the Patriots, while the only one who stayed in America (William) who stayed loyal to the Crown. On both sides, they became so disgusted with the self-seeking and corruption they saw from the side that they could study up close, that they ended up idealising the more distant side as unrealistic paragons of virtue. A note: pictured on the cover is not William Franklin, but William Temple Franklin. As an author myself, I can't imagine how Sheila Skemp's stomach must have dropped through the floor when she realised that.